For Kevin and Aimee Beimers, two young Canadians who made their way around Australia on a tandem recumbent tricycle, Tasmania was the ultimate challenge — and reward. And, their stories and photographs tell it all. By KEVIN & AIMEE BEIMERS | Somewhere between Adelaide and Melbourne, during our round-Australia circuit, we began sparring with the idea of "adding on" Tasmania. After all, we thought, can we really say we've cycled the entire country if we miss a state? Sure enough, it may be a small state, and you need a very large boat to get to it, but it's still Australia. Even if they forgot about it at the Olympic Games opening ceremonies, we weren't going to overlook it. According to Tasmanians, we'd only been to the North Island so far. Yes, we decided. “Let's add it on." "Adding it on" was a major blunder in thinking on our part. One does not "add on" Tasmania. Adding on Tasmania to your Australian cycling trip is like ordering a 3kg porterhouse steak and "adding on" a family-size supreme pizza. Tasmania is its own meal in itself. One can't think of Tasmania in terms of the rest of Australia. The Outback, the Kimberley, the Pilbara. Those were long and hot, but the challenge was mostly mental. We'd move the pedals, the bike would go forward; the fact that we could see 300km into the flat, bleak, red distance, guided only by the light of successive heat lamps warming month-old sausage rolls, that's what really made us cry into our pillow at night. Tasmania's challenge was point blank physical, all the way. From now on, whenever someone stops us and says, "I was thinking of doing something similar myself. How was the Nullarbor?" my reply will be, "Mate, forget the Nullarbor. You want to challenge yourself? Try Tasmania." 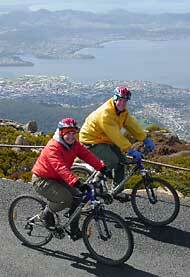 Tasmania is quickly becoming a very popular touring destination for cyclists, and a well-deserved one. There aren't many places on the Australian mainland where you can get lost in massive green canopies, spend hours climbing white-capped frosty peaks, and still always be within reach of a good feed and a comfortable bed. The people are friendly, talkative, accommodating, and best of all, impressed by large distances. From Launceston to Hobart, a 2 1/2 hour drive, it's considered customary to throw an overnight bag and a few packets of K-rations in the car. The fact that you're riding a bike, well, let me put it this way. We were riding through Campbell Town, about 120km from Hobart. A lady waved to us and asked us how far we were travelling. I shouted out, "Hobart!" in too much of a hurry to get into the long story of our grand escapade. "Oh my God!" she gasped. I shudder to think what might have happened to her had we said, "Brisbane!" The best thing about cycling in Tasmania is that they've conveniently divided the state into three clearly defined levels: easy, medium and hard. Or if, like us, you prefer not to be pegged into the "easy" hole, you can call them the Historical Route through the centre, the Coastal Route up the east, and what we affectionately referred to as "The Great Western Chainbreaker". 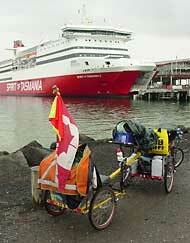 The easiest and most direct route from the Spirit of Tasmania to the capital of Tasmania is the Midlands Highway. It meanders between Devonport and Launceston, then shoots straight down to Hobart bypassing a number of small, pretty, historic towns. The road is flat by Tasmanian standards, but has a nice field of view in most places, so no worries about the traffic. It's a nice, comfortable ride, and you're never too far away from a pub. The East Coast of Tasmania actually follows the basic tenet of unoriginal sarcastic map readers: if you're heading north, mate, it's all uphill. Sure, ups lead to downs, but the ups get upper as you get further up, if you know what I mean. To start down at the south end you'll find Port Arthur, the Alcatraz of Australia, and as you head north through Triabunna, Swansea, St Mary's, St Helen's, and finally Scotsdale, well, let's just say if you can crack our top speed of 67km/h, we'll be mighty impressed. Along the way, you'll be rewarded with a gorgeous view of the ocean, unmatched by anything we've seen so far on the mainland. As for Level 3, the Chainbreaker, if anybody tells you that west is "a bit hilly," they're lying. It's a lot hilly. In terms of ruggedness, Western Tasmania is to Tasmania as Western Australia is to Australia: the east-coasters don't like driving over there unless they absolutely have to. As a general rule, the wigglier the road looks on a map, the more hours you're going to spend climbing peaks hundreds of metres high, screaming wildly down the other side in a hard-earned frenzy of white-knuckled truck dodging, and the west coast is nothing if not wiggly. As you pedal off the boat at Devonport, the west just narrows its eyes at you and says, "Come on, punk. I dares ya". If, like us, your chain skips from the strain of pedalling off the boatramp at Devonport, the west points at you and says, "Hah hah!" in a mocking falsetto voice. Chances are you take better care of your bike than we do. If you don't, shame on you. If you do, maybe you'll take that dare. However, our battle-worn machine, of which it has been suggested that the derailleurs be bronzed rather than lubed, was only open to one course: Easy. To say we chose the Midlands highway because of our lust for history would be like Bert Newton saying his hair is naturally orange. At first, we weren't even sure if we were going to be able to leave Devonport. For the first three days after arrival, the weather patterns seemed to be centred around the direction our trike was facing. That is, if the trike was pointing away from our Cosy Cabin, angry grey clouds would form and we'd be soaked through in 10 minutes. When we said, "Who in their right mind would cycle in this?" and turned back to the cabin, the sun would come out and say, "Suckers". This happened three times one day. With a pattern like that, I'd rather have a nice day indoors than a crummy one outdoors. As we learned later, Devonport is notorious for nasty weather and gale force winds. If you can time it right (and it takes many long hours of peeking out from behind the curtains) you should be able to squeeze yourself into a weather window and achieve escape velocity without too much aggro. Fifteen minutes up the road, it's clear as a bell. Trust me. It is. Our first day out had us feeling great. We tackled the first few hills with gusto and enjoyed the feeling of being somewhere completely different. I think at this point in the expedition, it's exactly what we needed: a bit of a shake-up. It's like Day One all over again! Everything old was new again (except our trikes, of course). The city of Launceston, our first major city in Tasmania, is built to bring people in and keep them there. Literally. I'm not talking necessarily about the tourism, such as the James Boag & Son Brewery or the Cataract Gorge, although we did enjoy them. No, I mean the city itself is built at the bottom of a huge basin, such that no cyclist who enters can possibly escape without building up momentum in a giant skate-park half-pipe sort of way. 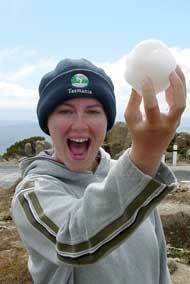 If you could fill the entire Tamar Valley with, say, ping pong balls, man, you'd need a lot of ping pong balls. Once we were able to break orbit out of Launceston, we took a rest in the quirky town of Evandale, which holds its own little piece of cycling history. 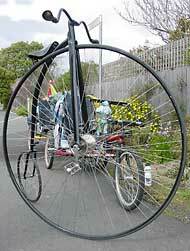 If you've never heard of Evandale, obviously the wheels on your bike are too small. Evandale is host of the Annual Penny Farthing Championships, home of the Velocipede Society of Australia, and once Guinness World Record holder of "The Greatest Number of Penny Farthing Bicycles Free Standing and Held Together by Hands Only" — 69, to be exact. They have a certificate. 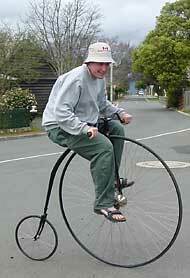 I was given the chance to try riding a penny farthing. Before you say, "Harrumph, they've never looked that hard to me," first put yourself in my shoes: I'm going from basically sitting on the road in my recumbent to hovering two metres off the ground. I'm going from three 50cm wheels to two wheels, one of which is 1.6m tall. The handlebars are at the same level as my knees, the pedals are hard-fixed to the wheel, and when I turn a corner I have to turn my legs. While I'm whinging, there were also very high winds that day. But, I'm proud to say, I did it! I kicked off from the park bench, did a little circle, and came back (on my fourth try, that is). I felt like a champion. Sure, I may not be fast enough to get into the competition — some of the racers get up to 40km/h, and lean into the turns — but if, say, Aimee was pregnant and I had to get her to the hospital, and all I had available was a penny farthing and a little red Radio Flyer wagon, and maybe some rope, I could do it. The Evandale Penny Farthing Championships take place each year in February, when the town triples in population and contestants fly in from all over the world (with very large luggage, no doubt).